Vehicle Tribology was chosen as the topic for the 17th Leeds-Lyon Symposium, as it was decided to be a timely opportunity to bring together experts of many disciplines connected with problems of emissions, particulates and energy efficiency associated with the automobile engine. The volume contains 55 papers divided into eighteen sessions. A selection. Sessions: I. Keynote Address. Eight questions to tribologists (J.P. Pirault). II. Design/Analysis. Design and analysis: A perspective for the future (D.R. Adams). III. Engine Tribology - Bearings. Comparison between aligned and misaligned bearings under dynamic loading in both quasi-static and dynamic misalignment (P. Maspeyrot, J. Frene). Mass-conservative design analysis for engine bearings (J.F. Booker, A. Kumar). Heat flow in crankshaft bearings (J.M. Conway-Jones, R. Gojon). Development of crankshaft bearing materials for highly loaded applications (I.D. Massey et al.). IV. Engine Tribology - Bearings. Feed pressure flow in connecting rod bearings (S. Boedo, J.F. Booker). Effect of the mechanical linkage used for measurement purpose on dynamic behaviour of an elastic connecting-rod bearing (J. Launay et al.). Non-linear transient analysis of diesel engine connecting-rod bearing with circular and non-circular profiles (D. Vijayaraghavan et al.). V. Engine Tribology - Piston Assemblies. A review of tribological aspects of piston assembly design (B.L. Ruddy, M.L. Hildyard). Distributed law of engine cylinder liner hydrodynamic lubrication oil film (H.S. Wang, J.Y. Fu). VI. Engine Tribology: Valve Trains. Valve train lubrication analysis (C.M. Taylor). Running-in wear behaviour of valve-train systems (B.J. Roylance et al.). A technique for measuring roller follower skidding on automotive camshafts (S. Bair, W.O. Winer). VII. Friction Materials: Brakes. Brake noise and vibration. The state of the art (D.A. Crolla, A.M. Lang). Heat flow and temperatures in friction material during braking (A.J. Day, A.B. Ashi). VIII. Tyres. Lubrication of model asperities on rubber (A.H. Muhr). IX. Seals. Non-Newtonian Lubricants (Z.S. Safar, T.A. Osman). X. Transmissions: Traction Drives. Evaluation of efficiencies and speed ratios of CVT's with planetary cones (A. Ishibashi et al.). XI. Friction Materials: Clutches. Computer-aided analysis and optimization of friction clutches and brakes (H.N. Iliev). XII. Belts. On flat belt slip (B.G. Gerbert). XIII. Seals. On the elastohydrodynamic lubrication of reciprocating elastomeric seals: The influence of the surface roughness (A.F.C. Kanters.). XIV. Transmission: Gears. A pitting fatigue model for gear tooth contacts (R. Dwyer-Joyce et al.). XV. Lubricants. Engine lubrication: Art or science? (R.C. Coy). XVI. Engine Materials: Lubricants/Traction Fluids. Development study of new traction fluids for automobile use (T. Tsubouchi et al.). XVII. Engine Materials: Ceramics. Ion beam assisted deposition of adherent lubricous coatings on ceramics (G.R. Fenske et al.). XVIII. 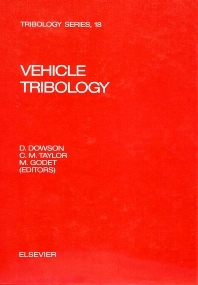 Company Perspectives in Vehicle Tribology. Present status and future direction of engine tribology at Nissan (K. Hamai et al.). Written discussion - contributions.